I wish I could say I spent a few amazing days exploring the great city that is Quito, but Quito turned out to be a repeat of Medellin and Bogota- sick, sick, sick. 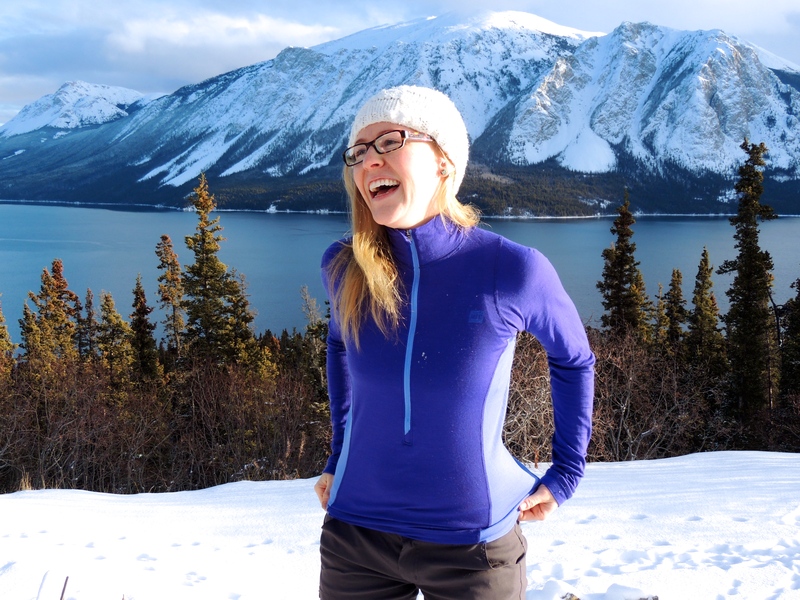 You can read about my adventures dealing with illness for over a month on the road here. 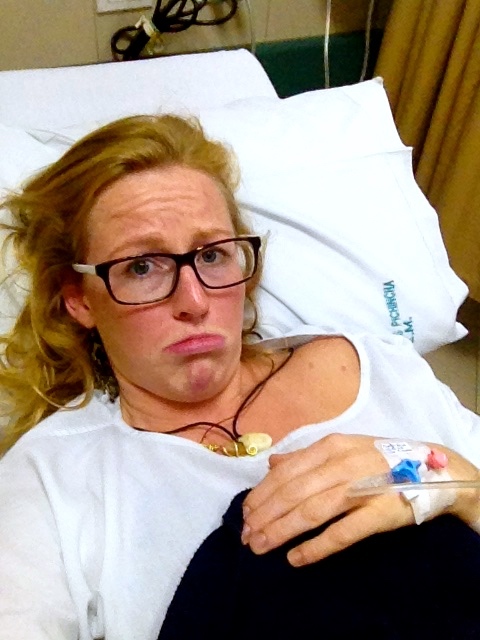 We spent 5 days in Quito, most of them being in the hostel bed, bathroom and couch, and then in the hospital. All we wanted was to get on the road. Other than exploring the streets near the hostel and on the way to the hospital, we didn’t really get to see any of Quito, unfortunately. We walked to the super market a couple of times to load up on soup, bread and rice which was all we could stomach. After a few days we were nearly delirious with desire for anything other than ichiban soup. 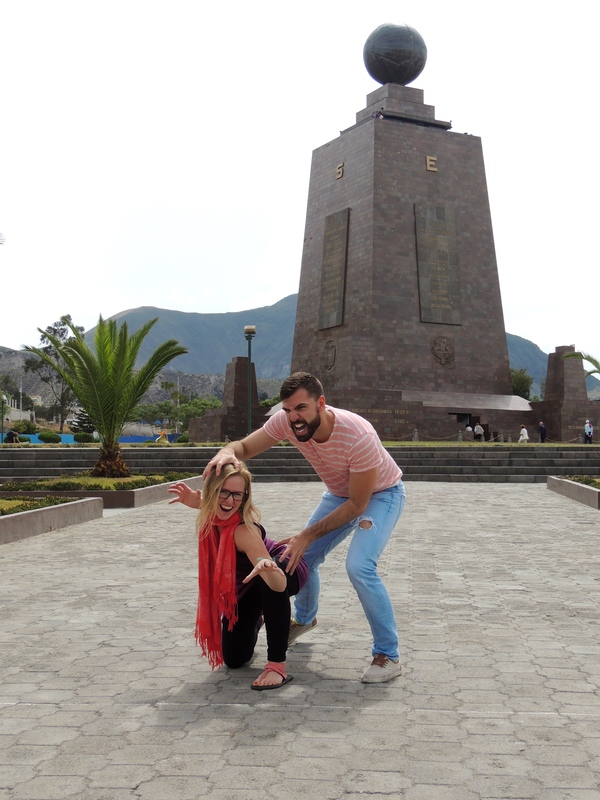 The only excursion we set out on was to head to the equator which ended up in me getting painfully ill, almost as a lesson to not leave the hostel! Other than being terribly sick near the end of our day it was a a great way to get out and see a bit of Quito on the long drive to the Equator park. It’s cheap and there are lots of little shops – but it’s a pretty tourist heavy excursion; though still neat to learn the history! 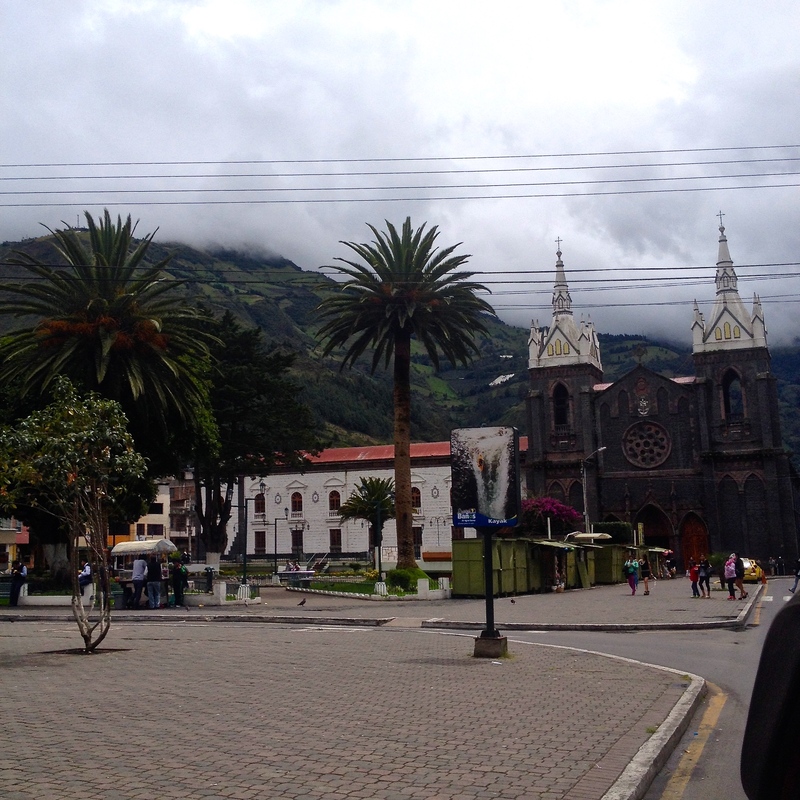 After going to the hospital and getting treatment and medicine at last to fix us, we made plans to bust out of Quito and head for the mountain town of Baños that I’d heard so much about. On our last day I ventured down to the market to peruse and buy some warm alpaca items, as heading south it would only be getting colder. It was bold to venture so many blocks by foot from the hostel when I was still feeling so sick, but I couldn’t leave without seeing the market, which I was told was like a mini-version of the famous market in Otavalo. I was overwhelmed with the 15 or so aisles in the little market- I wanted EVERYTHING! There was so much colour, so much alpaca, so many bags! It was impossible to choose. I walked through the aisles and began to narrow down the sweaters I wanted and ended up buying a backpack as well. The next stall I went to I saw a pack I liked even more and ended up buying it too! My advice: walk through the entire market, scope out what you like, get some prices, and then, only when you’ve seen it all should you make any purchases. It was great and easy to bargain at the market, they always dropped their prices and things ended up being fairly priced. 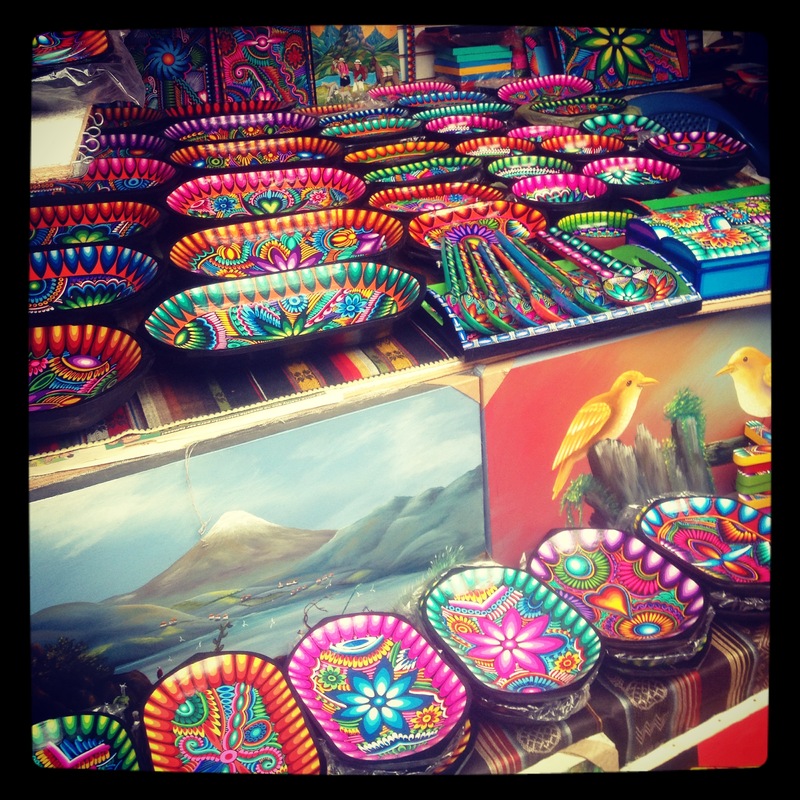 I was told it was even cheaper than the big market in Otavalo. I ended up with a thick warm zip up alpaca sweater, a pair of alpaca socks, an alpaca scarf, another lighter alpaca sweater and two backpacks. And I was using restraint! It took a lot of will power not to buy five times that much. 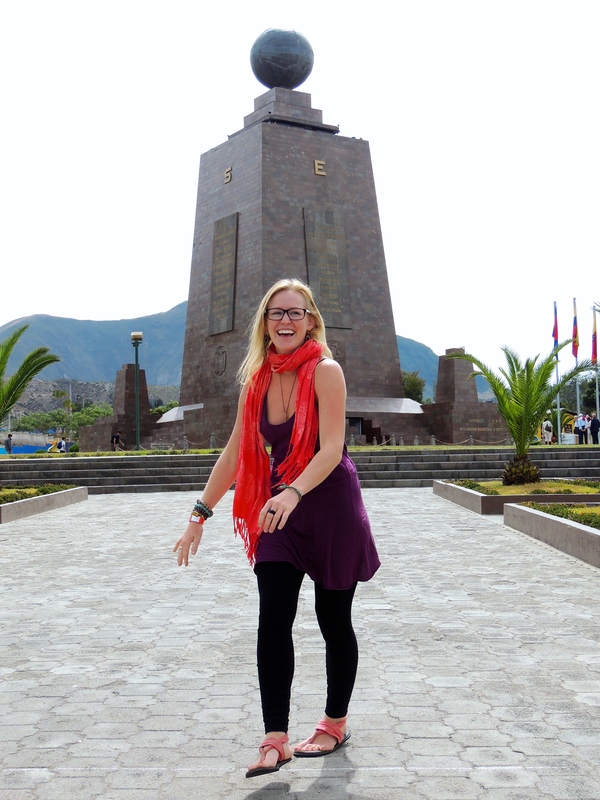 We solidified our plans to head to Baños the next day, the adventure capital of Ecuador. I was sorely disappointed I would be unable to attempt to summit the famous Cotopaxi Mountain due to being so ill. Even if I had been cured quickly, I was terribly weak from not being able to retain any water or food for so long and spending most of my time sitting or lying down. I lost a lot of muscle mass and a great deal of my cardiovascular strength. I was winded from the shortest walk or climb of stairs. So instead we went straight for Baños up in the mountains. We arrived in the evening, found a cab that took us to our hostel just outside the main bustle of the town and settled into our room. We ended up having the whole five bed dorm to ourselves. The hostel owners only spoke Spanish but they were wonderfully friendly and always helpful. The father would always offer to drive us into the town centre so we didn’t have to pay for a cab. This awesome little train ripped around town blasting music and carried screaming children on a thrill ride. My one regret was not hopping on! Baños is crazy beautiful. We were still having troubles with our guts but things were slowly improving. We stuck to the soup and added some basic pasta in to our diet to cut the awful monotony of the soup. It was glorious. We made all of our own food, not daring to test our tender stomachs yet by eating out. Oatmeal and fruit for breakfast, soup for lunch and pasta for dinner: simple. The next day we got a little tour of the city from the hostel owner to see where things were located and decided to book a tour. We signed up for canyoning- something neither of us had ever done. We were picked up in a 4×4 jeep and hit the winding roads, cruising through the mountains for about 45 minutes to get to our spot. We had about a 25 minute climb up the mountainside, which some American girls had warned us was ‘really strenuous’. Sure we were out of breath, this was the most exercise I’d had since Tayrona, but it wasn’t as bad as the girls had made it out to be. We felt proud for getting to the top in our weakened condition and then got geared up for the rest of the adventure which was all downhill- er, down waterfall, from here! Canyoning is crazy fun. Crazy fun!!!! Our guide was awesome and spoke in slow simple Spanish to us, which was great practice and made sure we understood everything, especially the safety aspects before beginning. We strapped into our safety belts and cautiously rappelled down our first waterfall. It was just Anthony and I and our guide and his helper so we got a really intimate experience with our guide. I was super pumped when I got to the bottom of the first fall- what a rush! Each fall increased in difficultly and with it our courage grew as we loosened up our grips on our ropes and let ourselves jump out further and faster. By the end we were wildly tossing ourselves down (well at least we thought it was pretty wild!) 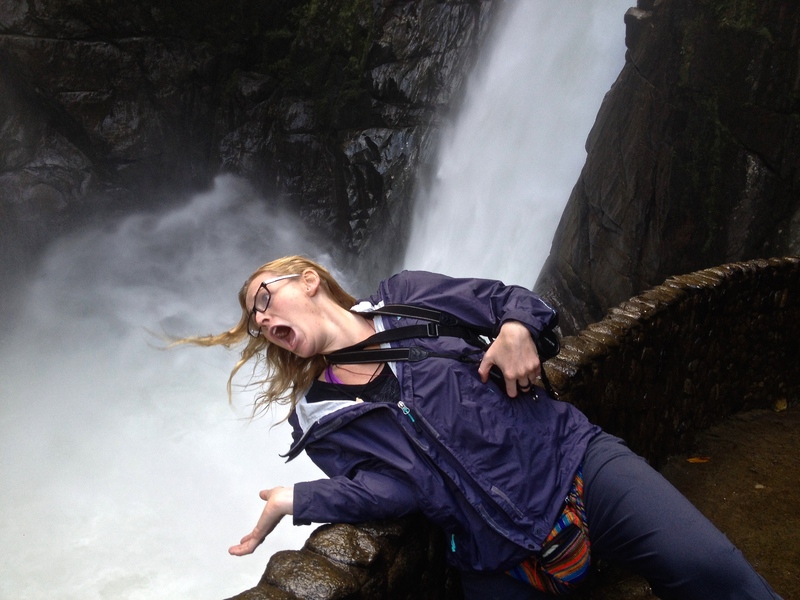 and screaming as we flew down the waterfalls. The tour was only $20 and worth every penny and more. At the bottom of our last fall we got to slide down on our bottoms while the guide jerked us back by our safety rope into a pool and each time we tried to get up to slide down he would yank us back, drenching us in the cold mountain water and laughing. He had to get his kicks somehow! We gathered in the pool at the bottom for some group pictures and our guide accidentally knocked my glasses out of my hand and down into the murky water they went. I was devastated; I loved those glasses, they were my favourite! However, it was stupid of me to wear them on such a tour. We searched and searched and I was sure it was all in vain, but our diligent guide wouldn’t give up and after 20 minutes we formed a tight line and carefully swept the area and finally Anthony held them up in victory! I was so happy I jump-hugged him. Okay, this is a terrible picture of a picture- better pics to come soon when I can get them uploaded! 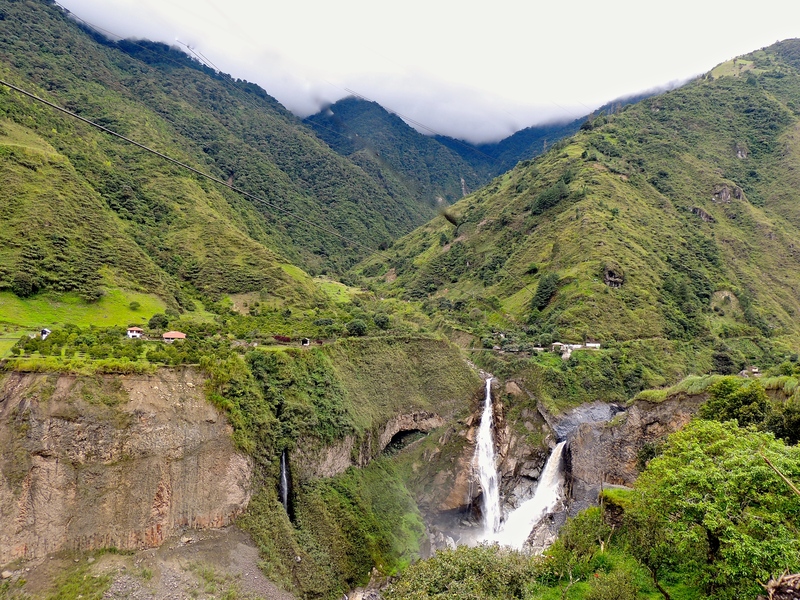 The next day we decided to really venture from our comfort of never straying too far from the hostel or from bathrooms and rented bicycles to bike the 15km along the highway to see the waterfall circuit that Baños was known for. The bike ride was mostly all downhill or flat and I kept thinking ‘my god, we’re never going to make it back!’ The ride started out rainy and windy alongside the highway and we were slightly discouraged at the damp start. But soon the rain stopped and we could enjoy the incredible scenery more. 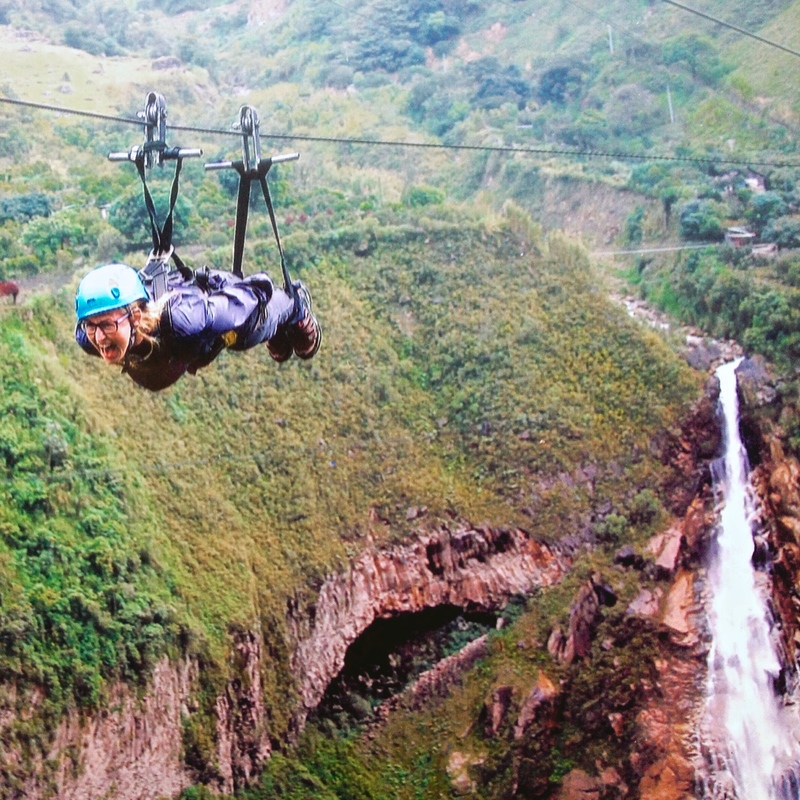 After a few kilometers we came to a zip line that tore across the vast gap in the valley and raced towards a huge waterfall on the other side. We stopped to inquire about prices – only $10 for a zip there and back! Heck yes! Anthony had never been before, so he was pretty anxious. We spoke in our broken Spanish to the staff and they explained that they had a film crew here doing some filming for tourism and asked if it was okay if they filmed us and told us it would be on TV in Ecuador, Mexico and the States- were gladly agreed and probably made asses of ourselves trying to say something in Spanish for the camera. We screamed all the way across this canyon, heading straight for the waterfall! They hooked up our zipline (which was definitely the least safe zipline I’ve ever been on: no secondary or tertiary safety security, they just wrapped some canvas around a t-bar and off the guide went to the other side to accept us!). Anthony asked me if it looked safe and I hid my slight anxiety at the amateur safety of the operation and assured him it looked fine. They attached an Ecuador flag to our feet and sent us off at the same time, screaming across the wide canyon heading straight for a massive waterfall. We landed just above it screaming with exhilaration. 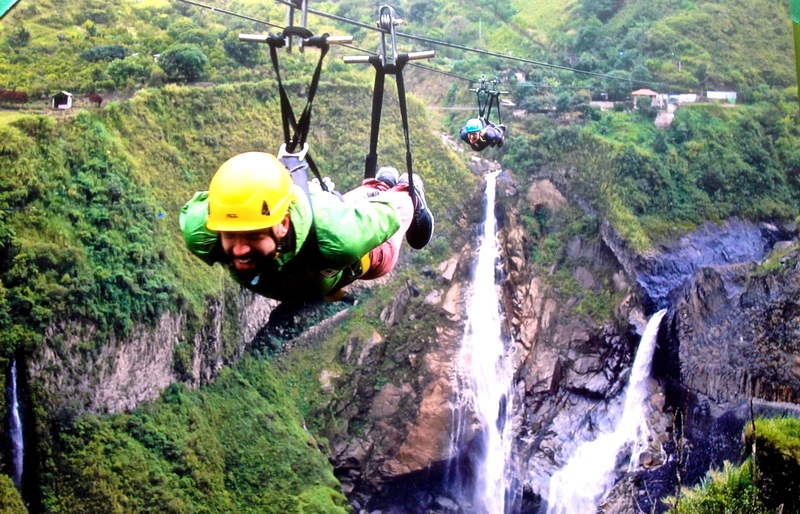 I had been zip lining twice before, but this was a really great experience doing it over the canyon and the waterfall. We zipped back on a different line and came screaming in at top speeds looking like we were going to smash headfirst into a huge metal structure, but our guide- laughing hysterically- stopped us just in time. We got unstrapped, shaking slightly and laughing. They had snapped a great picture we could buy for 2$ and didn’t hesitate to after we saw it. We hopped back on our bikes and picked up a French couple to tag along with us. We stopped at waterfall after waterfall as the clouds cleared and the sun came out changing the temperature drastically and causing us all to strip down. I was ecstatic as our bikes cruised down the paved roads and then veered off onto small dirt paths that were cut into the mountain side for bikes only, offering us outstanding views of the valley and surrounding mountains. I lost count at how many waterfalls we stopped to admire, but finally our adventure took us to the biggest one of all, Pailon Del Diablo (you may have seen it in the movie Proof of Life), so named because locals believed you could sometimes see the devil behind the gushing waters. We parked our bikes, locked them up and began the half hour hike into the falls. I was proud of Anthony and I for jumping right in and getting so much exercise in the last two days after our long bout of illness. I think Baños was exactly what we needed to begin healing (along with the amazing medicine from the hospital of course!). The hike winded us, but it was worth it. The waterfall was a massive, powerful cascade of gushing water that pounded down in fury like the fist of God (or the Devil perhaps?). The white spray screamed from the top of the mountain and blasted into the pool below with violence. They had created stairs in the mountain side that you could climb up and down for different views – be warned- you will get soaked here! The best part however was yet to come- they had carved into the mountain side little pathways that you had to literally get down on your knees to crawl through tunnels and crevices so you could get closer and closer to the waterfall until you were finally behind it’s raging stream, getting drenched with it’s cold spray. We laughed and snapped photos trying to protect our cameras from the water by hiding them within our rain coats. If you have even a little claustrophobia, I wouldn’t recommend venturing into the tunnels in the mountain as they are pretty tight and a little scary. I had a hard enough time crawling through, I felt bad for the tall folks like Anthony! We had found out upon arrival that you could pay a small fee to have one of the trucks at the waterfall take you and your bike back – I nearly collapsed with relief- the idea of trying to ride up all those hills was horrifying! I knew I would be walking my bike and trying to hitch hike within the first 20 minutes. 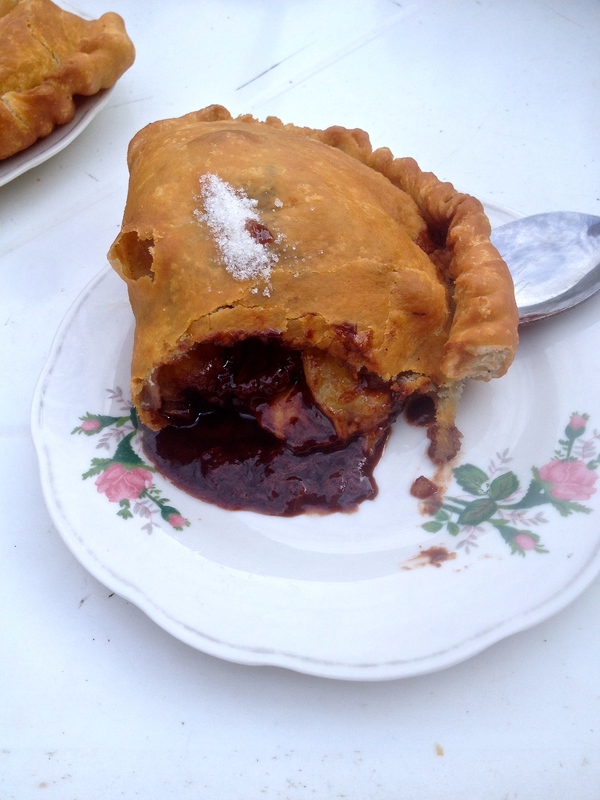 We paid the driver and then waited around for a half hour for any other riders who wanted to join and treated ourselves to a wonderfully fresh and tasty banana chocolate empanada! YUM! That night, Anthony and I decided to treat ourselves and get a cheap massage and then hit the baños- or the baths (no, not bathroom! ), that the town was named after. 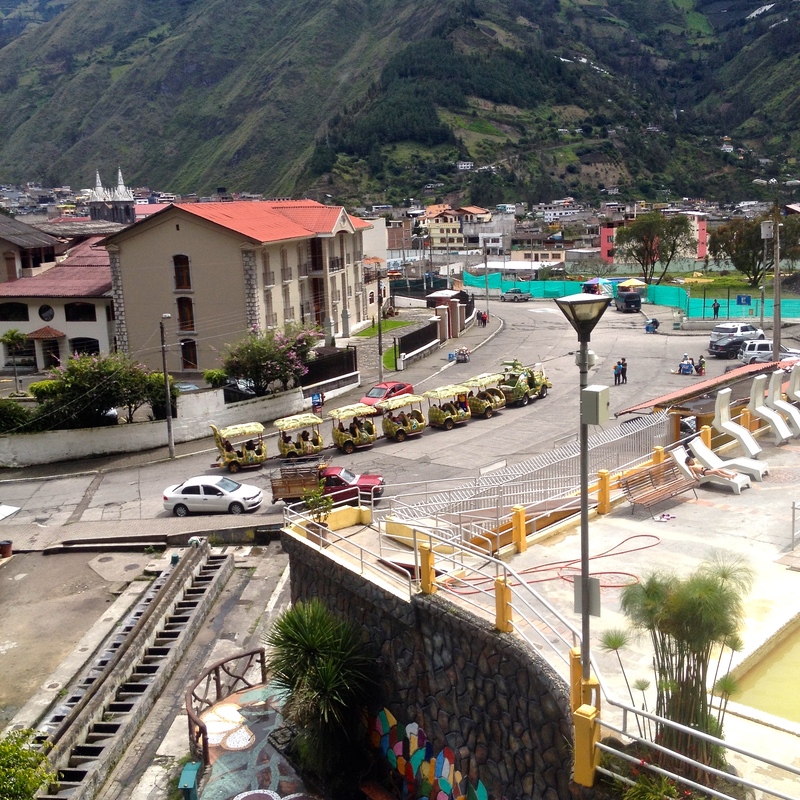 Volcanic activity from the neighbouring beast Tungurahua volcano left a network of aguas calientes that the town capitalized on. 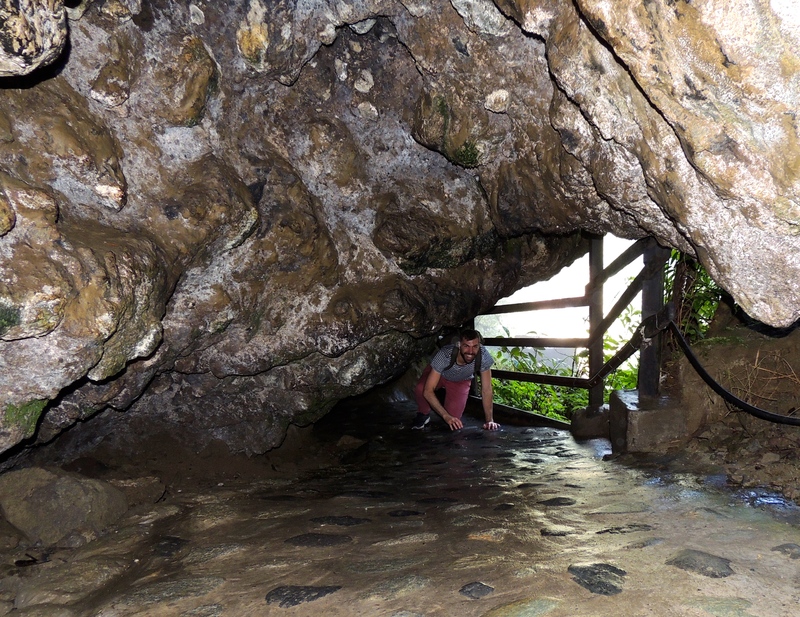 The locals used the baths as much as the tourists, believing in the healing power of the mineral waters. We signed up for our cheap massage – $10 for an hour and half? Yes please! We didn’t expect much for that price, but we got even less than we expected. But at least we got a good story out of it! We showed up at the parlour and then were led immediately on a 5 minute walk through the rain to a totally different street and building. We were led inside a room that was set up with two beds- they clearly thought this was a couples massage, even though we had asked for ‘seperado’. We laughed when they left the room to let us get undressed and said to hell with it and stripped down and hopped under our blankets as it was quite cool in the room without heating in the mountains. Our girls came back in and set to work. If you could call it work. I would say it was more of a ‘rub’ than a massage, and an awkward one at that. I couldn’t relax at all because I was dying of holding in bursting laughter the whole time. I kept waiting to hear Anthony crack up and knew that would surely be the end of the massage as we both broke down in violent hysterics, but we somehow both held it together. I’m also exceptionally ticklish on a particular area on my back, and every time she pressed there, my whole body seized up and I jerked violently. She didn’t seem to notice however and kept on going, putting me through agony at trying to hold it together. They put some strange pungent incense under our noses, ‘aromatherapy’ they called it. I think it was just a squirt of old ladies perfume perhaps. I think my masseuse was in training as each time I could hear Anthony’s masseuse begin to karate chop him, mine would stop mid rub and quickly replicate her. After a very long hour the massage finally ended and Anthony and I nearly burst of relief when they left the room and we could finally let out our laughter and disbelief at how bad the massage was. I thought everyone could give at least a decent massage without any practice or training, but this was just awful. You could tell the women had no interest whatsoever in what they did and I was quite sure they just watched a few youtube videos for training and then lackadaisically tried to replicate what they saw with no pressure or finesse. Nuestra Senora del Agua Santa Church in Baños, built from nearby volcanic rock, hence the dark colour. We headed home after a big day for bed, and I bid goodbye to Anthony the next morning as he headed for Guayaquil while I lingered a day longer, wanting to try my hand at white water rafting for the first time. I set out in the morning with a group of 8 or so others and our guide and we hit Rio Pastaza after some brief training. The river was only a level 3 with the chance of a level 4 at one point in the river so it was perfect for beginners. It had rained tirelessly the night before so our guides told us the river would be fun today. And it sure didn’t disappoint! Out guide spoke in Spanish and joked around with us endlessly and manipulated the boat at times just to get some of us tossed out. I was pretty sturdy and held on the whole time, but ended up jumping out of the boat just for fun with the rest of the group. The scenery along the river was beautiful and we had a few tumultuous rips through some of the rougher rapids, all proud at getting us through without tipping. It was so exciting to finally try something I’d wanted to try for so long and now I can’t wait to go again and again! I set out the next day to meet up with Anthony down in Guayaquil and hopped on a cheap $7 bus from Banos which was about a 7 hour ride. This is when the the awful experience of being robbed happened. I put my day pack under my seat, as the seat in front of my had a bag under it already. Sometime in those first 2 hours the man behind me slipped my bag from under the seat from behind, broke through the locked zipper, removed my laptop and camera and then slid the bag back without me even noticing, and I wasn’t even sleeping. I was completely oblivious until I checked into the hostal in Guayaquil and decided I wanted to look something up on the internet. I went to open my bag and saw the zipper was separated, but thought only that it was the cheap quality of the bag I had bought in the market. I unlocked it, unzipped it all the way and went to pull out my laptop that was no longer there. I panicked. Surely I must have packed it in my other bag. I frantically checked everything, all the while in the pit of my stomach i knew it was gone. It wasn’t even until about 15 minutes later that I realized that my camera was also missing. It was like someone slammed me in the stomach with a bag of bricks. I felt so sick. I felt cheated. I felt disgusted. I felt stupid. I felt downright awful. 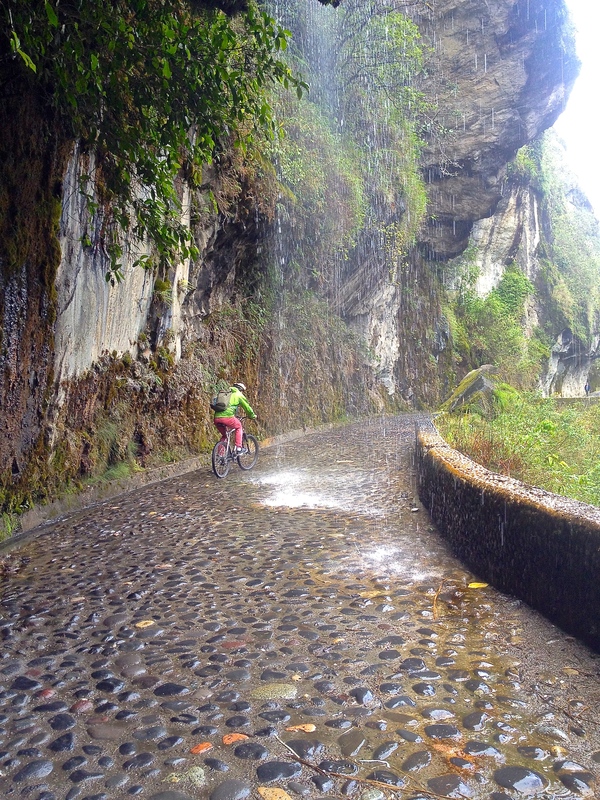 Biking the stunning bike trail on the waterfall circuit, and getting a little wet! I let myself feel pity and hurt for a short while, and then I decided there was nothing I could do but move on and not let the experience hurt me or my travels. They were simply material things, and things could be replaced. The start of setting out on this journey involved letting go of nearly all of my material belongings and living out of a backpack. I went through a wonderful stage of learning to let go of materials and it was liberating, so I suppose it was all practice for learning to let go of two things I cherished deeply. I luckily was able to go online and lock my macbook from ‘find my mac’ and set it to automatically wipe clean the moment someone connected it to the internet. I felt instantly better as this was the hardest part of the theft- knowing someone was about to have access to all of my writing and all of my pictures- very intimate and personal things. I was proud of my new self and how graciously and quickly I was able to set aside the hurt and anger and feeling of possession and accept what happened and not let it bother me any further, but simply move forward. They were just materials after all, and while crucially important to my travels for my blog – they could be replaced. The ultimate saving grace was that I had backed up all of my pictures just the evening before. So while I lost the camera and the laptop, I was able to luckily retain all of the pictures. I decided I would order a new laptop and a new camera so I could continue blogging which is so important to me on this journey. I also took it as a sign from the universe that it was time for a new and better camera, time for me to dip into the world of the DSLR cameras and learn some tricks of photography. I was seeing the world after all, and I should want to document it as best I can, being the story teller that I am. I also had some extra unexpected money coming in from a will inheritance, so while it was a major loss, the universe as always seemed to balance things out and I was able to move past the theft and make the best of a bad situation. Read my blog post HERE on my experience with the theft and how to keep your belongings safe on buses to be sure you don’t fall for the same tricks and have your things stolen! I was unable to claim insurance for this because the next morning Anthony and I were flying out to the Galapagos islands and I couldn’t change the flight in order to go deal with the police station report that was needed. I didn’t have the receipt for my camera as it was a gift and my laptop was already four years so I doubted I would even get the max $500 insurance coverage for it. I was disheartened that the day before I went to the Galapagos my camera was stolen, but there was nothing to be done but go to the islands and enjoy them with my own eyes instead of from behind the camera lens. I still had my small waterproof camera and my iPhone that I could snap some photos with anyhow. So I sucked it up and got myself excited for the next morning- the opportunity of a life time- one most people never get a chance to experience- the Galapagos Islands! ← How To Not Get Robbed On A Bus, Like I Did…! Thanks babe! It’s been such a journey 🙂 miss and love you too! can’t wait for your next blog post!